Prahran, an inner suburb and a former municipality, is about 5 km south-east of central Melbourne. It was originally surveyed for farm allotments and land sales occurred in 1840 and later in 1849-50. Although intended for farming the allotments attracted house construction, on large blocks in the north and east of the district, and on smaller, subdivided blocks in the south and west. The resulting distinction between grand residential (partially superseded by upmarket apartments), and worker's cottages remains. The latter was stimulated by the need to house gold rush immigrants. The north and east are today's Toorak and South Yarra, and the south and west are today's Prahran and Windsor. Prahran's name evolved from ‘purraran’, understood to be an Aboriginal word for ‘almost surrounded by water’. The proximity of the Yarra River and swamp to the south-west part (of which Albert Park Lake is a remnant), explain the description. 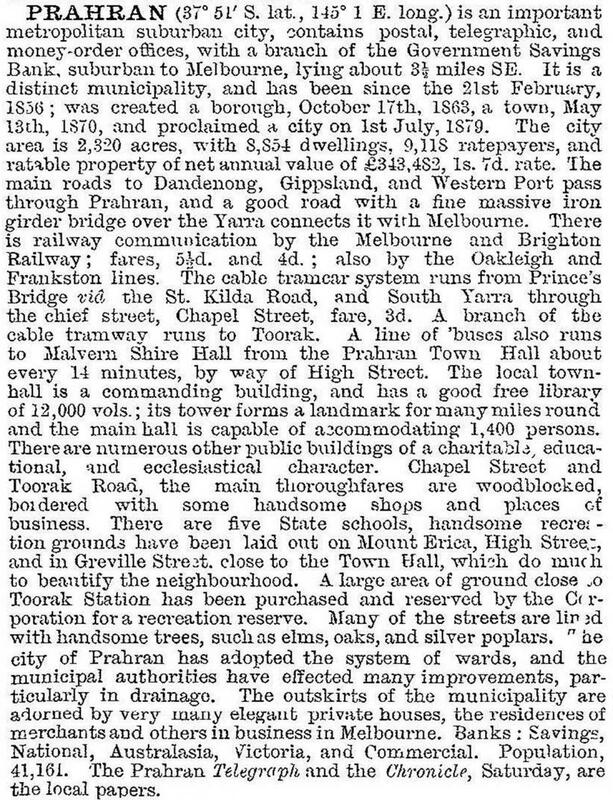 Purraran was rendered as Prahran by Robert Hoddle, Government surveyor, in 1840. In 1859-60 a railway line was constructed through Prahran from Melbourne to Brighton. A second line branched westwards from Windsor to St Kilda, Windsor being the station after Prahran. The Gippsland to Melbourne line traversed the northern localities of Prahran by 1879. Prahran had a web of public transport routes when cable trams were opened in Toorak Road and Chapel Street in 1888 and 1891, and two major shopping strips grew along the tram routes. Chapel Street is the main one, with several large emporium buildings still standing. By 1927 the Prahran municipality had five electric tram routes: Dandenong Road (1911), High Street (1910), Malvern Road (1915), Toorak Road (1927) and Chapel Street (1926). The Prahran and Malvern Tramways Trust built the first three routes. Four denominational schools were opened in the Prahran area between 1852 and 1854. In 1855 the Prahran municipal district was created, becoming a borough on 1 October 1863. The Mechanics' Institute (forerunner of a technical college) was opened in 1864, and the Prahran market in 1875. In the same year the first State primary school, at Hawksburn, was opened. During the 1870s the Prahran municipality's population grew by 50% and in the next decade it doubled, reaching nearly 40,000 in 1890. By the 1890s much of Prahran had been laid down in terms of utilities, commercial facilities and residential areas. Chapel Street grew as a sub-metropolitan shopping centre, in the 1880s and again after the 1890s Depression. Chain stores such as Foy and Gibsons (1902), Maples (1904), Treadways and London Stores opened there. Charles Moore Read Company's emporium (1886) was enlarged in 1902. At around this time several food processing and textile industries developed in the western part of Prahran. The best known were the Australian Jam Company (later the Jam factory shops, 1979) and Kia-ora soups and cordials. During the early postwar years slum reclamation projects coincided with a boom in flat building throughout the Prahran municipality. There were private flat developments in east Prahran and Housing Commission developments in Prahran and Windsor. Prahran became home to migrants from Britain and Europe. The two largest groups were Greeks and Britons and in 1966, 16,000 of Prahran's 55,000 residents were born overseas. 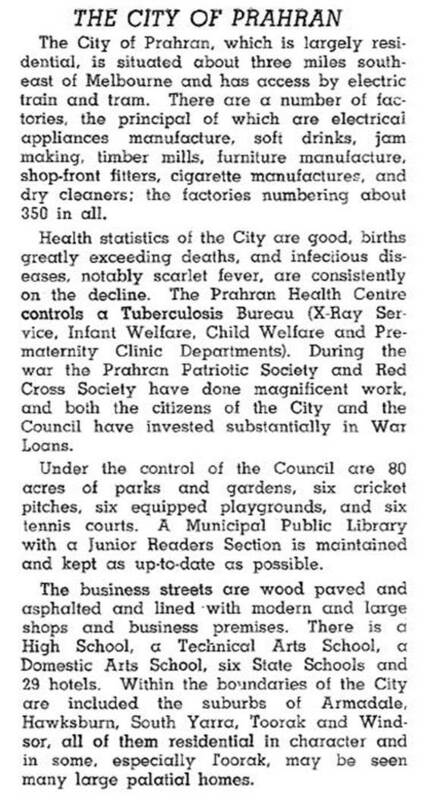 Prahran council and Councillor Horace Petty, who was also the State Minister for Housing until 1961, supported the construction of flats on reclamation areas, with the added benefit of arresting population decline. Two large estates, one named after Petty, are in Malvern Road, South Yarra, east of Chapel Street. Prahran high school (later a secondary college) was opened in 1965. In 2014 community consultation opened in the first stage of renewal plan for the Horace Petty, Bangs, King and Essex Street housing estates to guide long-term renewal of housing, outdoor areas and community facilities at the four sites. By the 1970s Prahran's population was falling and its houses became attractive to people with small or no families. Gentrification and renovation of older housing became strong trends, and migrants sold their houses to willing bidders. The Jam Factory in Chapel Street, converted to a shopping venue in 1979, was further converted to include cinema facilities in 1995. Moores department store in Chapel Street became the Pran Central shopping venue. Older retail styles survived in Greville Street beside the Town Hall and in the market in Commercial Road. Swinburne University has a campus on the site of the former Prahran College in High Street. It was taken over by the Northern Melbourne Institute of TAFE (NMIT) in 2014. Prahran Secondary College was closed in 1996. A commitment to a new public high school in Prahran was announced in 2014. Greville Street, besides its niche retailing, has the railway station at the western end and the former town hall, fire station, police station and court house at the other. All are on the Victorian Heritage Register. In 2012 a piece of 15-year-old Prahran street art by Banksy of a parachuting rat was destroyed when a hole was made for plumbing pipes. Prahran suburb extends from Punt Road to Orrong Road and from Malvern Road to Dandenong, excluding the south-west part which is the suburb of Windsor (see separate entry). Prahran municipality, containing parts of South Yarra and Toorak and all of Armadale, Hawksburn and Windsor was united with Malvern City to become the City of Stonnington on 22 June 1994.